Going for a gentle stroll in the middle of Bangkok's monsoon season. Trying an exotic local delicacy from the stand next to the bug vendor's cart. Running on a treadmill in 100 degree humid heat. Some things start out seeming like a good idea. Which is why I never thought twice about swimming in our pool during betel nut season until one hit me squarely on the head. In the middle of a little sans-children relaxation, I swung my feet up and brought myself into a back float. Closing my eyes, I inhaled the sweet smell of jasmine and listened to the dull bubbling sounds brought on by having your ears under water. The sun warmed my face and my mind drifted until..... THUMP. Right where my hair meets my forehead an insanely hard object ricocheted off my head. Startled and swallowing a bit of water, I steadied myself to see the golf ball-sized, persimmon-colored fruit floating next to me. 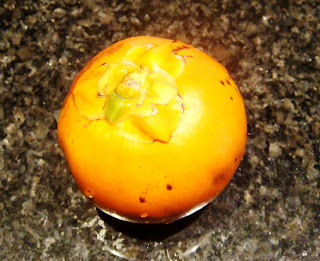 With a lump forming on my head, I held a perfect betel nut in my hand. Freeze frame for an instant: I mention that it was a perfect specimen because I had secretly been after one for a good couple of weeks. A friend was surprised to hear I'd never tried one before. "You cut into it and find the seed. This is what you chew on and it releases a mild tobacco-like calming sensation, similar to a cigarette." Honestly, not one with a taste for tobacco products, I surprised myself when I thought, "Well, that's a local experience I may never get the opportunity to try again." Our property has trees of different tropical fruits lining the sides and for the past week the morning ground had been covered by the betel nuts. But, add to this knowledge when you're envisioning our fruit covered tropical oasis: Our beloved house dog could be spotted with a betel nut in his mouth at nearly every hour of the day and all of the fallen fruit seemed to have been partially chewed on overnight by various animals and/or insects. Perhaps you now see why even the whack in the head could be overlooked when I now held an unscathed betel nut, fresh from the tree, in my hand. Ummm... mild tobacco-like calming sensation? I never got to the sensation since the taste was exactly like what I'd imagine taking a cigarette, wadding it up like a piece of gum and giving it a good long chewing would be like. One bite into the seed and my betel nut hunting came to a screeching halt. Even after merely one bite, I continued to taste the foul thing for a solid 24 hours. So, needless to say, when I went back to the pool a week later and was once again pelted by a falling betel nut, I threw it towards our happily panting house dog. While some things just aren't a good idea (see the above narrative), here's one that is. The combination of rum, coconut and shrimp, with a little acidic lime juice thrown on top, is a perfect ending to a tropical day. Combine the eggs, salt, pepper, rum and flour in a shallow pan. Place the panko, sugar and coconut into a different shallow pan and mix. In a large deep skillet, heat the oil. Place the end of a wooden spoon into the oil, when bubbles form gently around the wood the oil is ready. 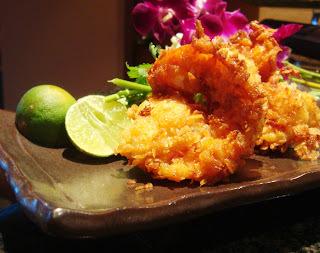 Working with one shrimp at a time, roll them in the egg mixture, followed by a thorough coating in the panko crumbs. Place gently into the oil and cook until golden brown. The time will vary depending on what size shrimp you selected. Plan for 1-3 minutes, flipping once. Drain on a rack and serve immediately with lime wedges. I've been craving coconut shrimp. Very timely! The shrimp looks delicious! How's your head? Was it as hard as a golf ball too? Thanks for the giggle... What type of dog do you have? We have a Cocker Spaniel. My little baby! You should have won Foodie Fights! I've been lurking on your blog for a few months now- am a chef from Dublin and into Thai food since honeymooning on the Thai Gulf. Thanks for the reading and hope to see you enter more competitions. Your cooking provides a nice twist on traditional Thai recipes that I haven't found on other sites. What's happened to my dear Shelby? Smoking a beetlenut now? Where does the craziness end? Have fun. Hanlie, you're so welcome for the giggle! The dog came with the house and is an adorable poodle mix, named Carrot! Josh, Thank you for the wonderful compliments. I'm thrilled to have you following along on my adventures in Bangkok. Please feel free to send along any recipe ideas you'd like me to try and chase down on Bangkok's streets!